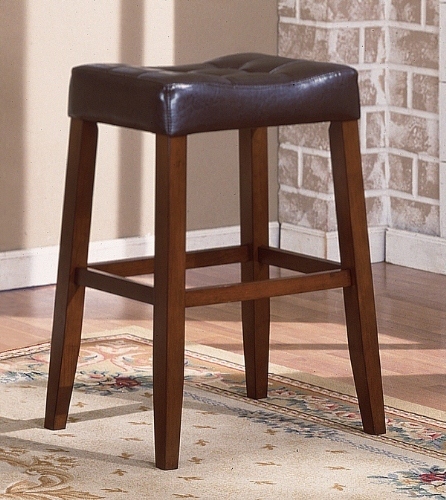 This Beautiful Portman Saddle Chair (Bar Stool) in the Espresso Finish Seat Cushion: The cushion top is dark espresso/brown finish with a leather texture and a shopping 3 1/2" thick. Seat Cushion Top: 19 1/2" W X 14"
Height of Seat Cushion: 3 1/2"
Bottom Part: The item is solid wood and a cherry/espresso finish. There is a place for your feet to rest while you are on the stool. Add extra style and class to compliment all your furnishings whether it is around your counter in the kitchen, in your game-room, or anywhere you need extra seating. We are offering a very hot item at a competitive price. Features: That is a very large seat for a saddle stool and it is comfortable too. The cushion is button pleated to give it awesome detail making it elegant and rich looking.